Overriding Methods in Java - How it works? 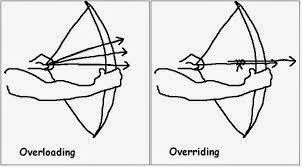 Method overloading and method overriding are two important concepts in Java. It is very crucial to know the way they are work and the way they are used. The main motive of this post is to understand Method overriding and it's usage. Lets quickly understand what both terms mean and move on to the overriding part for details. Name of the function remains the same but the number and type of arguments changes. Note : Also keep in mind method overloading is a compile time phenomenon. Which if the overloaded method is to be executed is decided at compile time based the method signature. Method overriding comes into picture only when there is inheritance involved. If there is a method in a super class then a sub class can override it. Let us first see an example and then dive into various aspects of it. Lets say we have a Animal class in a package called worldEnteties. It has a move method as follows. Also we have a Dog class which extends this Animal class. In this Dog class we override the move() method to do some different movement(Dog specific). Now when you create a normal Animal object and call move() on it, it will simply execute the function in Animal class. Now when we create a Dog object and call move() on it, it will execute the corresponding move() function. 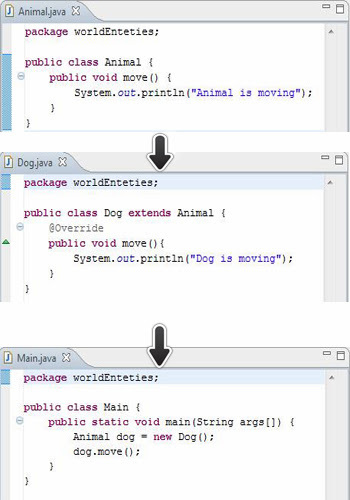 Q ) What if I wast to invoke move() in Animal when move() in Dog is invoked? After all Dog is an Animal. Method Overriding is a runtime phenomenon!!!! At compile time all that java compiler knows is the reference type Animal in our case. All compiler does is check whether move() method is present(or at-least declared) in the Animal class(If not compilation error will occur). As in our case it is present and code compiles fine. Now When we run the code, it is at this time the JVM will know the runtime class of the object [You can also print it using dog.getClass()] which is class Dog in our case. Now JVM will execute the function in Dog and we get our output. Another important point to note is that the access modifier of the overriding function can be liberal! Meaning if access modifier of super class is private than modifier of overriding method is subclass can be default(no modifier), protected or public. It cannot be the other way around(overriding method cannot have more strict access modifier). Note : Access to static/instance fields and static methods depend on class of the polymorphic reference variable and not the actual object to which reference point to. Also variables are never overridden. They are shadowed. The access modifier must be the same or more accessible. The return type must be the same or a more restrictive type, also known as covariant return types. exceptions are allowed to be thrown.